Stay on top of your trips by connecting your calendar with the My Trips module in EverTrue! Follow these steps to enable the connection. Syncing between My Trips and your calendar provider is one-way. This means that edits to trips need to be made in the EverTrue platform. Any edits made in your calendar application will not make it back into EverTrue. If you have connected a prior calendar service with EverTrue, you will need to disconnect the older service. Follow the disconnecting steps here after you complete the syncing steps below. 1. Navigate to the My Trips section of EverTrue. In the top right corner, use the pink Actions button to select Connect External Calendar. 2. 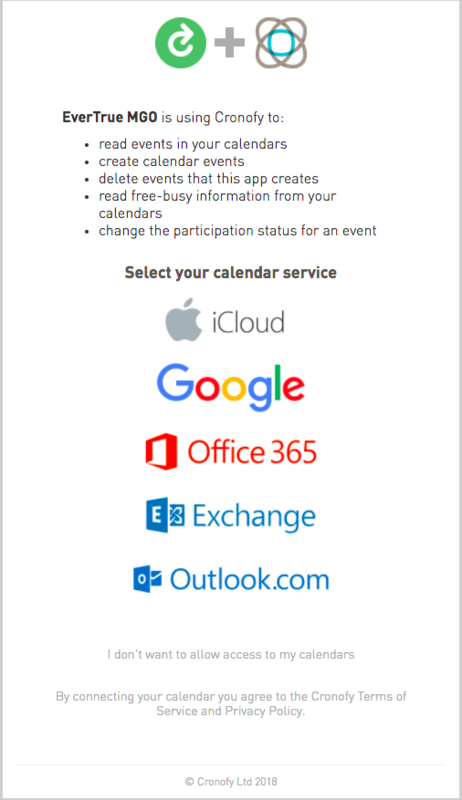 You will be taken to the following screen asking for permission for Cronify (the calendar sync provider) to manage your calendar. Please select your calendar provider from the list and follow the steps to enable your calendar. 4. Check the boxes of the calendars to connect. You may see other calendars in this list that aren't your own. Do not be alarmed -- these might be institutional or peer calendars that you have access to through your calendar provider. 5. Then you are all set! Any trips and edits will automatically push to your calendar. Use the instructions linked here to delete the EverTrue calendar. Now you're all set! Reach out with any questions to genius@evertrue.com.